Ancos is the only toller focused on the engineered plastic sector that combines grind and dry capability. Ancos, with an extensive amount of expertise with engineered materials that often require cryogenic grinding, works with numerous partners across the rotational molding, coatings, and carrier resin markets. Specifically, Ancos has been regularly grinding nylons and polyesters (and their extruded compounds) for over 19 years and is adept at managing the unique and sometimes difficult processing nature of these materials. Ancos is regularly approached by customers that are looking to grow their presence in the rotational molding market, which requires much of its plastic supply in a powder form to enable a smooth and consistent molded part. Our customers often have a number of tight specifications for particle size distribution, final moisture content, and contamination-free processing, and they come to Ancos knowing we have deep expertise handling nylons – providing pilot and commercial scale solid-stating, crystallization, drying, and material handling services, in addition to grinding. Given its properties, nylon can be a challenging material to reduce in size, and thus not all grinders are capable of meeting these demanding requirements. Nylon must be cryogenically ground to enhance its friability. Because moisture adsorption during processing is largely unavoidable, ground nylon must also be dried before it is rotomolded. Nylon’s hygroscopic properties (attracts water) require the removal of moisture (and other volatiles) to very low levels to support defect-free rotational molding processing. Ancos’ drying processes reduce the possibility that volatiles de-gas during the molding cycle. Nylon is a small, but growing material in the rotational molding space. Similar to the unique grinding requirements, nylons require some care in the rotational molding process. However, when properly molded, nylon products are strong, abrasion resistant, and have good impact, chemical, and fatigue resistance. Nylons exhibit low permeability to oxygen, gasoline, diesel fuel, and other solvents and therefore help non-road fuel tanks meet California Air Resources Board (CARB) and EPA emission regulations. Ancos works closely with our customers to fully understand all of the detailed requirements and specifications including particle size, maximum allowable moisture specifications, and packaging requirements. Once the specifications are set, Ancos co-develops a trial plan with the customer to run a small scale batch and validate that specifications were met on all of the key stakeholders’ needs, including the end customer. Once a trial is successfully completed, Ancos and its customers begin to scale up commercialization of the product. Ancos is able to achieve average particle sizes ranging from ~200-1000 µm (or 80-18 US mesh, respectively) and we are also able to dry powders to levels as low as 0.01 wt%. Ancos’ processing experience will select an approach most efficient at achieving target particle size distribution. We are also able to package powders in drums, Gaylord boxes and select types of bags. Given our re-packaging background, we can (and have) recommended bag designs that would best meet product objectives. 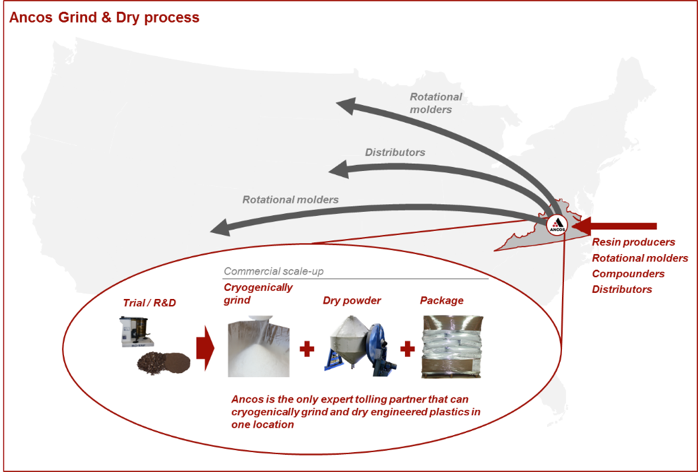 Our customers are often able to achieve significant cost savings and supply chain optimization by utilizing one tolling partner to both grind and dry their product. Ancos expertise and flexibility are also critical in supporting our customers’ success. Particle Size Distribution: Customers want to supply a product with particle size characteristics that are ideal for rotational molders. Customers rely on Ancos to outline and perform particle size and distribution characteristics which allows the rotational molder to optimize cycle time and finished part integrity. Moisture: Customers are regularly concerned about moisture levels in the product. Water in the nylon can ruin the integrity of a rotomolded part. In addition, one of the risks in drying nylon compound is burning off the critical additives in the compound. Customers rely on Ancos’ large scale dryers, history of polymer drying, and nylon know-how to meet a stringent moisture specification, without compromising the integrity of the compound. In addition, Ancos leverages its packaging experience to limit moisture exposure of the powder prior to reaching the rotomold customer. Logistics: Customers want to reduce logistics cost and the number of touch points between the customer and the molder. Ancos is the only toller with grinding and drying in one location, thus saving customers logistics and handling costs and mitigating contamination risks. Supply Chain Solution: Customers want to work with a particle size reduction expert. Nylon is tougher to grind than polyethylene, the major material used in rotational molding. Nylon’s throughput rates can therefore be lower as a result. 19 years of nylon grinding expertise allows Ancos to meet the customer’s high quality specifications in an economic fashion.